The hexagons will be familiar to long-time readers of this blog. I have run the parabolas version in College Algebra, and the hexagons version in my Ed Tech course. It was a huge hit both times—lots of conversation happened both electronically and out loud in the classroom. It’s a ton of fun. I am especially pleased with the rational functions version. 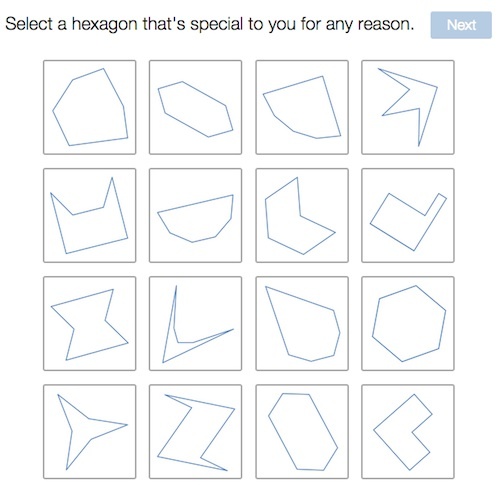 It makes for challenging work—even among the mathematically astute Team Desmos in recent trial runs. Read the Desmos blog post on the matter if you like. Forgive the delay. Here are pdf files of the hexagons we built for use in my hierarchy of hexagons lessons. You should be able to open and edit them in Adobe Illustrator. Consider them CC-BY-SA. Shout out to former students Jen Carlson, Nadaa Hassan and Brenna Magnuson for collaborating on these. Hexagons by Christopher Danielson is licensed under a Creative Commons Attribution-ShareAlike 4.0 International License. Update: Below is the current complete set, with added hexagons from former students Ruth Pieper, Brandon Schwab and Mona Yusuf. In defining Bobs, Stacys, and the like, did you run into situations where your definition admitted shapes the students didn’t actually want. For example, once you defined a Stacey as a hexagon with three congruent acute angles, did you draw some other Stacys and have students blurt out “wait, that’s not a Stacy — that’s not what I meant!” If not, how did you privilege the *definition* over some sense of “I know a Stacy when I see one.” Is it because their definitions were based on some property they liked about one example, rather than trying to say what was the defining quality of some *group* of hexagons? This instructional sequence is all about moving through the van Hiele levels. An important learning goal for these lessons is for students to separate what it looks like from its mathematical properties. That means we need to talk about this very issue. Early in the process, a central challenge is identifying precisely the property the student had in mind. This requires a use of language that can be unfamiliar and strange. Does “has a right angle” include rectangles, which have several right angles? Or did you mean “has exactly one right angle”? That sort of work comes first. Then we look for other shapes that have this property. If those early-discovered shapes violate the spirit of the original intent, the student may object and will be invited to revise. If she wants to add another property, then I will usually suggest that this is a second class of shapes, and that the one she was really after is the combination of these two classes. So your shape is special because it has all sides the same length AND it has at least one right angle. Let’s do this…let’s call hexagons with all sides the same length equilateral and let’s give a name to hexagons with at least one right angle…Who has a name for us? A “sally”? Good. From now on, a sally is a hexagon with at least one right angle. 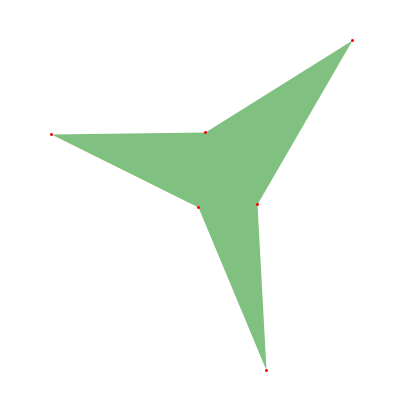 Now this shape is both equilateral and a sally. Let’s give this special category of shape a new name. That’s OK on day 1. 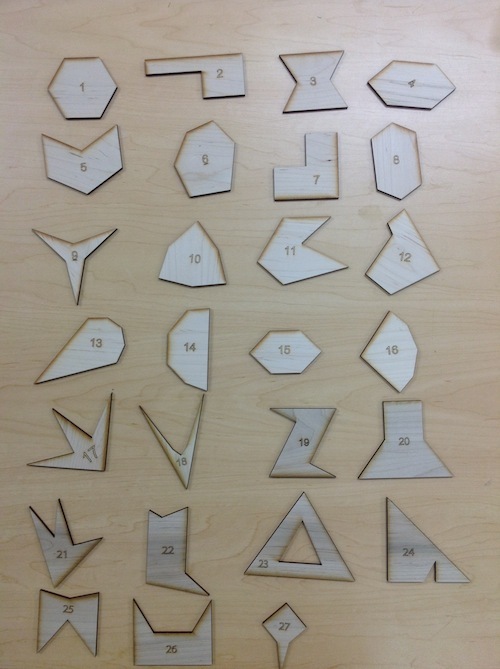 Our goal on day 1 of the lesson sequence is to have a set of between five and eight named classes of shapes that have interesting interrelationships. I need to be the judge of when we have enough, and whether they are of sufficiently interesting variety (I have screwed this up before). I reserve the right to add in some properties that I know will be interesting. For example, I make sure concave and equilateral make it into the mix somehow—either by student introduction or by my own. After day 1, we need to move away from what things look like. We will be operating only on the properties as we have defined them. If we accidentally left ambiguities, we can plug those holes as clarifications. But these definitions cannot otherwise change. It is important to notice that shapes with very different appearances can share important properties. It is important to notice that mathematical properties of shapes behave differently from the look of a shape. For example, this semester we defined a class of hexagons this way. A windmill is a hexagon with three acute angles and three angles greater than 180°. The iconic windmill is this one. Much later, as we were in the process of trying to decide whether a windmill can be a utah (a utah is defined as a hexagon with two sets of three parallel sides), we happened upon this most un-windmillish object. In trying to push the limits of windmill-ness, we started to consider shapes that had the right properties but that looked nothing like the original shape. For what it’s worth, we have produced a proof—which some of us can reproduce and others cannot—that a windmill is never a utah. 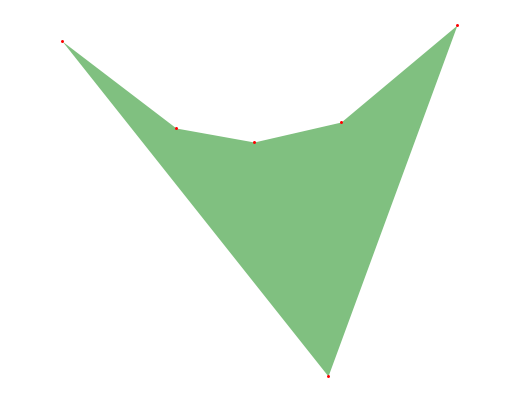 This proof depends on the Dani principle, which states that when two sides of a polygon are parallel and separated by a single side, then the two angles formed sum to 180°. This happens twice in a utah, which accounts for 4 angles less than 180°, leaving (at most) two possible angles to be greater that 180°, and thus a utah is not a windmill. It should further be noted that the Dani principle needs amending to admit the possibility of angles that sum to 360° (when one of them is greater than 180°) or 540° (when they are both greater than 180°). And it should be yet further noted that standards for proof are socially negotiated in all areas of mathematics, and that we had become quite confident that these cases would not come up with a utah, thus the weak version of the Dani principle was good enough for our work. Finally, if you have made it this far, you may be interested in the speculative origins of the hierarchy of hexagons. It has been a long road. I will be presenting the hierarchy of hexagons at NCTM in New Orleans. Friday morning at 8:00 a.m. See you there? This mathagogy video has generated some behind-the-scenes discussion in recent months. I have never taught high school geometry. I taught middle school, including some geometry there, have written some middle school geometry tasks, and I now work with future elementary teachers. That last is the context in which I developed my hexagon thing. The sequence I describe in the video is the end result of several years worth of trying to work out a way to get my students to geometric proof. Of course there is a lot more involved in the process than can be conveyed by a short video. Have you seen my blog posts on the sequence? Do students develop the ability to move up the levels through the entire year, or on each unit? I think of the van Hiele levels more as an organizing principle for instruction than as a principled diagnostic for students. But the levels do serve both purposes. Here is what I mean…I do think that most of my students (high school graduates; some young, some older; all students at my community college) come at a pretty easy to observe Level 1. They know names and properties of shapes but cannot talk much about how these properties relate to each other. That, I think, is pretty standard for entering high school geometry students too. I do not think that they become Level 3 geometers over the course of our work. Instead, I use the van Hiele levels as a way to organize instruction. So we start where they are with some noticing and naming of properties. Then we move to a tremendous amount of level 2 work. I probably describe some of that in the blog posts, and I should probably write up more of that. Over the course of several class sessions (we meet for 80 minutes twice a week), I push a little bit harder, and then harder still, on the arguments students are making. Eventually, through this modeling and through my explicit talk with them about it, they begin to be more critical of their own arguments, and eventually we reach a question that sort of requires proof; it seems true, but is non-obvious, and it has arisen from the questions we have been asking (at level 2) about how properties relate to each other. Creating and organizing the hierarchy of hexagons is often a useful part of this sequence. And then we move on. If we had the whole semester (or whole year!) to spend on geometry, I would imagine that level 2 work would be an important introduction in each unit. This is Serra’s conjecturing phase in the Dan Meyer comment. Is it reasonable to expect every high school geometry student to get to the top two levels within a unit (like circles)? I don’t think the top level (level 4, rigor) is a reasonable goal for every student. Sure, you can do Taxicab Geometry and notice that “circles” there look like Euclidan squares, but I am not convinced that this has a lasting effect of rigor on students. I do think having all high school students (for whom future elementary teachers are my proxy) use their ideas about relationships among properties of shapes to build a more formal argument that a proposition must be true is reasonable. Different students will be capable of different levels of sophistication in terms of the propositions they argue, and in terms of the arguments they make, but they can all do some level 3 work for sure. If I try to talk about the levels explicitly, do you think high school students will be insulted, not care or would they feel validated when they take a long time to get to a higher level? This is a good question. I debate this a lot in my own teaching. How much of the motivation and justification should I provide my students for what we are doing? I tend to talk about things in that spirit—we are doing X today because it will address needs that I know we have; here is how I see this activity getting us to our goals. And I try to provide specific evidence and the source of that evidence. A research basis is a good source of evidence, as is student work on quizzes and things kids say in whole group discussions. I would not spend time telling students what van Hiele level they are at. And I might not use the actual language of the van Hiele levels with kids (but then again I might). Our goal is to make formal mathematical arguments (proofs) in this course. Mathematical arguments take a different form, and have a different standard than a scientific argument or an argument you may have with your mom. But that is a goal, not our beginning place. I know from research I have read, from my experience in previous years, and by observation of your work and the ways you talk about geometry that an important part of getting to that goal will be exploring properties of shapes and how those properties relate to each other. So we will do a lot of that work. We will argue with each other. And over time, I will help you to make these arguments more mathematical. Eventually, you will be able to make such a great mathematical argument that we can call it a proof. Some of these proofs will be developed and written by the class collectively, and I will ask you to try do write some on your own. But it will be a while before we get there. Then, when we do get an example of a solid mathematical argument (whether because the class developed it or because I provide it), I make sure to stop, notice it and to have a conversation with the class about how that argument is different from the other work we have been doing. Do you know of any standard assessments that I can use to track my students’ progress with these levels? No. I ask my students to make short arguments on quizzes, and try to pose questions that admit both informal and more formal arguments. But I don’t know of good vH level instrumentation. It may exist. But I don’t know about it. My colleague Kevin Lee spent his sabbatical at the laser cutter. Here is the evidence. Dig it. I got a few of my future elementary students on the same machine (with tremendous help and guidance from Kevin). They made the featured objects in the next video. 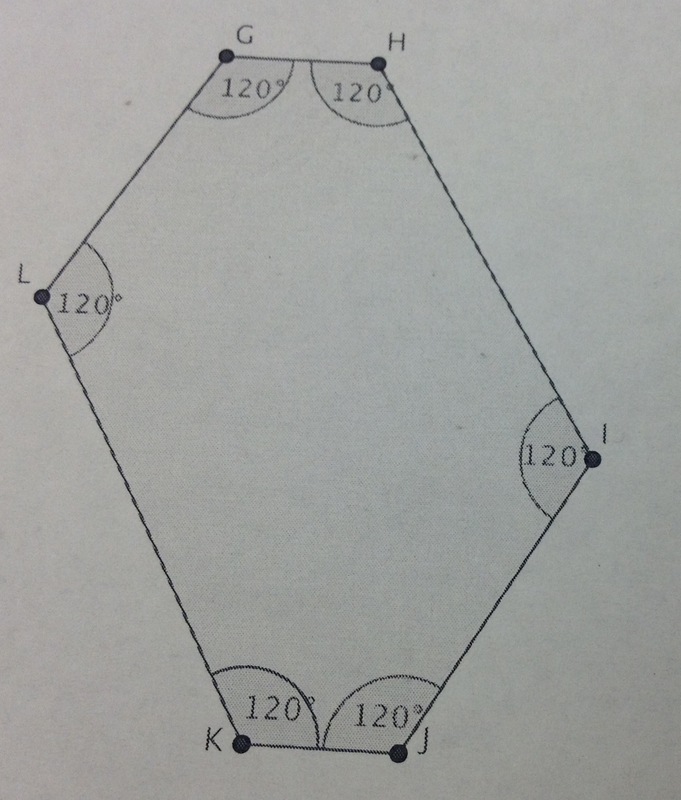 A student submission in response to the question, “Can a hexagon be equiangular, yet have no two sides congruent?” This is presently an A Assignment in my math for elementary teachers course, and is still open (although this diagram purports to resolve it with a counter example). Short note with a couple of important points about my hierarchy of hexagons post. This was about my helping them to better articulate exactly what they saw in these hexagons. I helped them to develop good language for describing properties (this is not easy to teach, nor to learn!). And I helped them to understand differences between properties and definitions (again, not easy for either party). Josh wrote in the comments, “I would have worried about leaving so many types of hexagons uncategorized or about not recognizing some of the important types.” Which reminds me to state that this activity is all about process, and not at all about content. Perhaps that last claim is overstated. I had a few items of content to sneak in there. Vocabulary such as concave. The difference between equilateral and regular. That sort of thing. But there was no one thing about hexagons that I needed to get on the table. Instead, hexagons were our territory for exploring mathematical practices. This was my second time through the activity. Last semester, my students noticed somewhat different things in the hexagons, and we ended up with candlesticks, chevrons, shields, starfish and rectilinear hexagons. Again, the exact properties and resulting categories aren’t what matters here. I did a much better job of integrating the hexagon sorting into the proof work. The Venn diagrams and the hierarchy were important to that. If you read carefully, you’ll see the van Hiele model play out pretty tightly as the underlying model for the sequence of activities. We did not proceed to Level 4.